U.S. President Donald Trump has been inundated with Japanese fake news after arriving in Tokyo on Sunday. Trump has kicked off a 12-day trip to Asia in Tokyo where he has been quick to accept as fact any compliments directed at himself. “I have it on good authority from everyone I had lunch with that I have tremendous chopstick skills,” Trump told journalists at a press conference. Trump has also told reporters that he now believes his spoken Japanese is “tremendous”. “Watashi wa Trump desu,” said Trump. 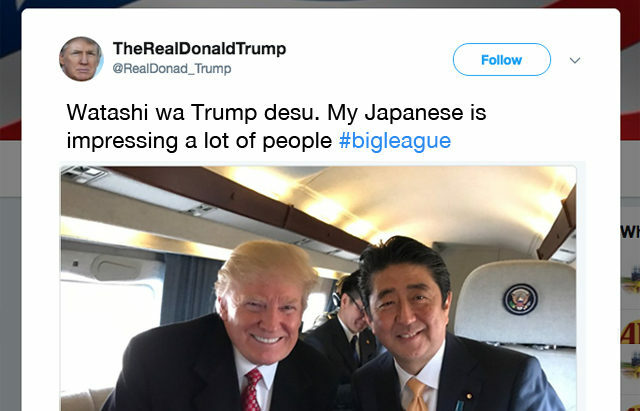 Trump says Prime Minister Abe is a “great guy” and together they were going to “take care of that lightweight Kim Jong-Un”, just after they “go for a round of golf”.